Imagine a marketing team that will serve as YOUR marketing department. Imagine delegating all your marketing projects, and even those back-burner ones, to a team that will produce and implement creative, professional materials & events in a timely manner. Well, you don't have to imagine anymore. 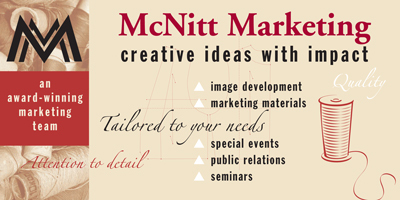 Increase your visibility, improve your image, and generate sales with the McNitt Marketing creative team, an award-winning marketing, public relations and special events firm. Not to mention seminars and a lot of other marketing expertise accumulated from decades of experience in marketing organizations in a variety of different industries. All of these great marketing services will be tailored to your particular needs in spreading the word about your company or organization! "We finally have a REAL booth. I couldn't have done it without you." 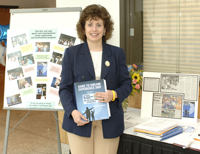 "The event was more successful than I ever imagined." exposure I was looking for." " You created consistency and professionalism that was lacking in the past."